Cabourg is a seaside resort in Calvados on the Cote Fleurie near Deauville in Normandy. It is one of several resorts developed on this stretch of coast - known as the Cote Fleurie - between 1850 and 1880, and perhaps also the most family-friendly resort in the region. 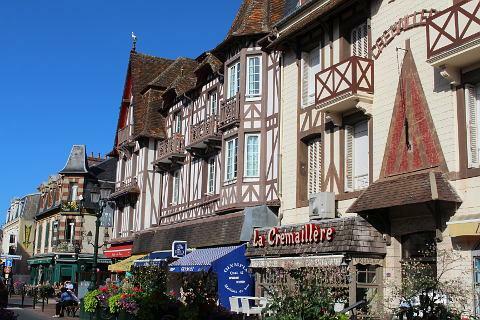 Cabourg owes its popularity to three things: the beaches, the interesting architecture and lively atmosphere in the town centre. 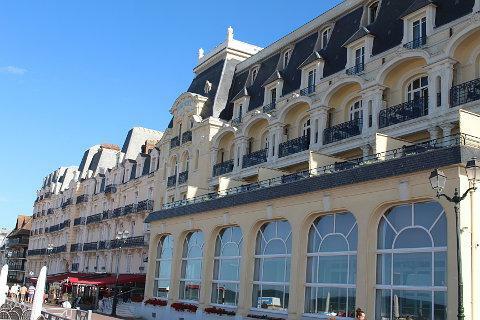 If you are looking for a good beach - indeed, a very good beach and certainly one of the best in this part of Normandy - Cabourg is perhaps the place you are looking for. As well as several kilometres of gentle sandy beaches you will find various activities available on the beach itself, such as wind-surfing, canoeing in the sea, volleyball, sunbathing, and other 'traditional' seaside activities such as golf, go-karts and swimming pools are close to hand. Another plus: the promenade along the seafront is more than three kilometres long and pedestrianised (the longest in Europe) which makes it great for jogging enthusiasts. 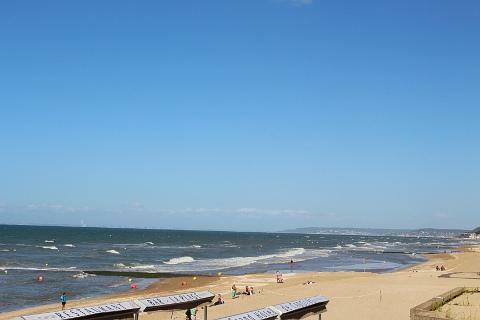 Cabourg has a lively atmosphere as well as being very attractive which makes it a great holiday location. The main street has lots of bars and restaurants and interesting shops. 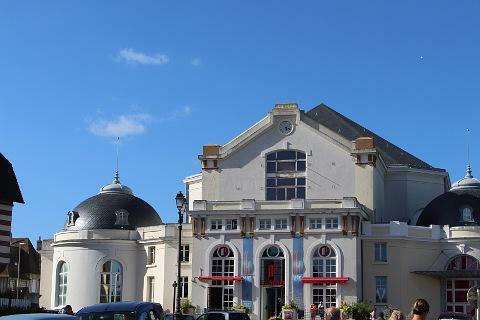 It stretches between the imposing town hall and tourist office towards the Grand Hotel and Casino on the seafront. In common with the other resorts along this stretch of coast Cabourg features a grand 'end of the 19th century' hotel (here the Grand Hotel) and a casino - the essential requirements of many a Normandy seaside resort, and key to providing the 'belle epoque' feel to the town, along with villas from the same period that you will see as you explore Cabourg. The Grand Hotel is on the edge of a large square surrounded by some really stupendous villas. The styles vary but all are very ornate and decorated with balconies, brick patterns, elaborate roofs etc. Those built at the end of the 19th century tend to copy the half-timber style typical in the Pays d'Augue region of Normandy. 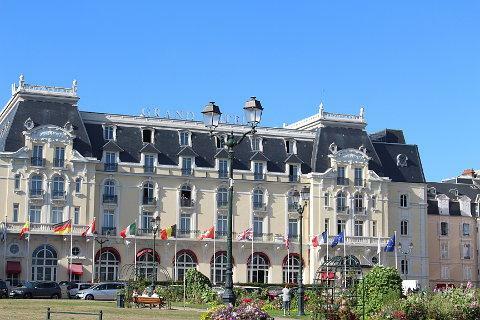 To give extra authenticity to the 'belle epoque' aspect of the town, Marcel Proust stayed in the Grand Hotel each summer from 1907 to 1914 and used the town as a model for the town of Balbec in the novel 'In Search of Lost Time' (you could perhaps bring a copy to read on the beach). The long promenade on the edge of the beach is named after Marcel Proust. It was originally built to protect the sea-front villas but soon became popular for walks along the seafront. 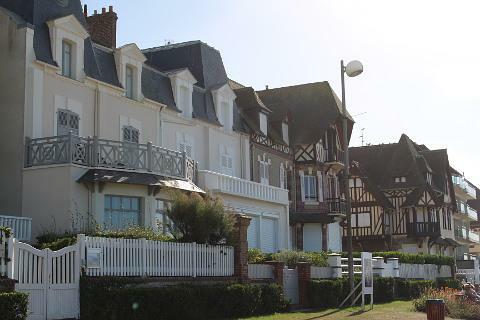 Although Cabourg did not exist before the 19th century, the historic port area across the river from Cabourg at Dives-sur-Mer has a much longer history: it was from here that William the Conqueror set off to defeat England in 1066! 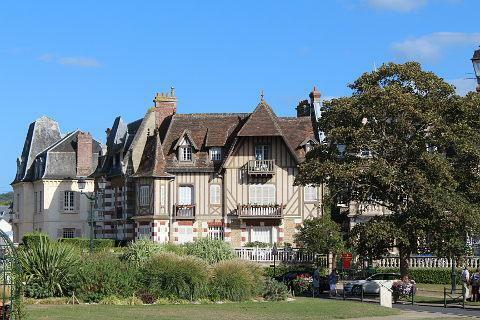 The countryside around Cabourg is known as the Pays d'Auge, and is a lovely countryside of gentle hills, orchards and woodlands, containing numerous picturesque little villages. The local Calvados tourist authorities propose various routes through the countryside to help you make the most of your visit, including the popular Normandy Cider route and others such as the Route des Moulins (traditional mills), the Route des Gorges de la Vire and the Route de la Suisse Normandie - ask for details in the Cabourg tourist office. 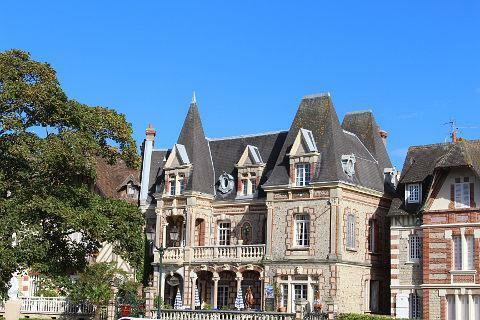 If you only have time to visit one Normandy village near here we suggest Beuvron, one of our favourites! 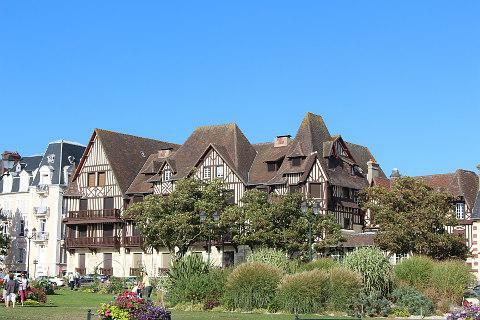 Back to the beach, don't forget to explore some of the other resorts along the Cote Fleurie - heading north-east from Cabourg these include Houlgate, Deauville, Trouville and Honfleur, among others. 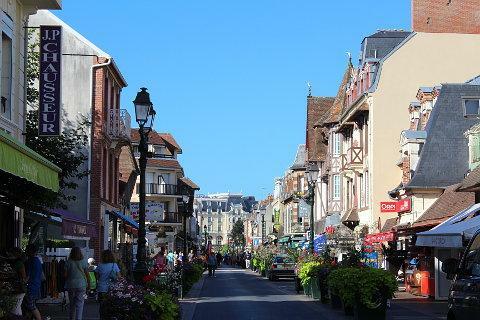 A seasonal market is held in Cabourg on Thursday & Monday & Saturday.